1) To share my research findings and current research into cricket in Cambridgeshire 1700 – 1890. I have researched Cambridgeshire cricket of the 18th and 19th centuries for about 15 years. I have written three small books: “A Tradition Unshared”, “The Cambridge Cricket Club Era”, and “Fenner’s Men”. Books are a limited medium, however, (at least mine are) and this site is intended as a more flexible way of sharing and updating information. I hope you find it interesting and enjoyable. Pictures used on this site have been haphazardly collected – mostly from books (often very old), newspapers, and library archives. I am trying to track down sources and copyright so that I can seek permission to use them. If you know the copyright owners of any picture where I have given no acknowledgement please let me know so that I can either do so or remove the picture if preferred. “New writing” is the beginnings a history of early Cambridgeshire cricket told through key events. See below for a list of contents. “1857-71” is an article outlining my view on the reasons for the Cambridgeshire sides of that period coming to a halt. “What’s in a name” is about a match in 1861 which I think tell’s much about Cambridgeshire cricket and illustrates some of those reasons. “Local context” attempts to put the cricket history into the context of the local history and geography of Cambridgeshire. “Research so far”, “18th century”, “1800-21”, “1822-37”, “1838-48” and “Villages 1822-48” contain some of my findings about players, matches etc. “Research gaps” summarises what I am looking into at the moment. “1st Cambs sides” is a discussion of which of several possibilities might best be considered the first Cambridgeshire representative side. “Robert Carpenter”, “Billy Buttress”, “William Cornwell”and “George Tarrant” are player profiles. “Gallery One” and “Gallery Two” contain pictures of Cambridgeshire players, matches and places from the 19th century. “Email me”– I would love to receive comments, queries and information. Spike Hughes, author of “The Art of Coarse Cricket” and other comic takes on sport, turns out to have played for Cambridgeshire in a friendly match against Huntingdonshire in June 1926 at the delightfully named Turnip Piece, Huntingdon. Patrick “Spike” Hughes batted at number 10 and scored a duck – but Cambridgeshire won. A little bit out of my usual era this, but it is always fun to find new connections. Two villages – Waresley, historically just over the border into Huntingdonshire, and Longstanton – appear to share starting to play the game formally relatively late compared with neighbouring villages. Waresley does not seem to have had a club until 1873 at the latest, compared with nearby Bourne (1st match 1826), Longstowe (1826), Caxton (1833) Abbotsley(1845) and Eltisley(1853) which started considerably earlier. Similarly Longstanton’s earliest match seems to be in 1880, compared with Swavesey (1844), Willingham (1850) and Over (1844). Does anyone know why this might be? A while ago now I had reason to re-examine the issue of whether or not the Cambridge Town and County Club (CT&CC) of the 1840’s was the first Cambridgeshire county club. I have always contended, based on my interpretation of contemporary newspapers, that the CT&CC was a souped up version of the Cambridge Town Club, which it replaced in 1844. Having looked again at the newspapers I would say that it is unclear. The new club seems to have been an attempt to attract support county wide as well as a better class of opponent. The former was not especially successful. The standard of opponent increased considerably from 1845, but whether this was due to the club’s status or to improved transport as the railway arrived in the town that year is a matter of surmise. Although attempts were made to arrange matches with Surrey and Sussex, for example, they never came to fruition and the only sides with any county club pretensions that were played were clubs in a similar position to Cambridge such as Swaffham/West Norfolk/Norfolk and Bury St Edmunds/Suffolk. There was the occasional local reference to the CT&CC as a “county” club, but most references used “the town” or the official title. This suggests a certain amount of confusion at the time. Retrospective references over the next few years referred to it mostly as the “Town Club”. At most it may be fair to see the CT&CC as “a” county club but not “the” county club that emerged later in the late 1850s nor the current county club which dates from the 1890s. I think the most accurate way to see the CT&CC is as a proto-county club – a town club with higher ambitions that were never realised. I would love to hear other opinions. Recent newspaper finds include revelations about Henry Cornwell one of the stars in the Cambridge Town and County Club of the 1840s. William Glover described him as one of the few batsmen who could cart the bowling of William Clarke and he seems to have been generally regarded as a charming rascal. prone to time wasting and chat likely to wind up the opposition. Then I came across a court report in which “the notorious ‘Baffy’ Cornwell” was both charged with theft and identified as the well known cricketer. On further investigation I found that the reason for his notoriety was his “other job” as a bully for the local Tory party, charged with getting up mobs for local hustings and possibly a go-between in in the much investigated bribery of voters. He seems to have had several court appearances and soon after the 1853 Cambridge commission into corruption left with his wife Phoebe to live in London. The contrast between his cricket and political persona is striking. I have also found an advance notice of of the 1791 match between Suffolk and Cambridgeshire at Newmarket. Not only did this confirm the match but it also challenged my previous assumption that this was an informal pick-up match. It may indeed be possible that this was a more official inter-county fixture than I first thought. If so this moves the date of the first known Cambridgeshire match back at least twenty and probably more like forty years. Cambridge or Cambridgeshire – A rose by any other name? Does it matter what a cricket club or team is called? When looking at Cambridgeshire’s cricket history it most certainly does. Cricket history books are almost unanimous in talking about the successful Cambridgeshire County Cricket Club throughout the 1860’s, when a look at contemporary sources suggests that teams now regarded as “Cambridgeshire” were variously organised by the County Club, Cambridge Town Club, individuals, public subscription and even the opposing clubs. These are important factors in understanding the state of Cambridgeshire cricket of this period. in the first half of the 19th century was the Cambridge Town Club. My own research in local newspapers, however, suggests that, apart from the years 1837-43, there was rarely a club of that name in existence. In its place were many other clubs each with their own unique story. The real wonder of the works of such pioneers as Haygarth, Waghorne and Buckley is how few errors they made given the enormity of the research and recording tasks they took on. Nevertheless they did make mistakes and it is a sobering lesson for any cricket historian when an hypothesis based on one of these revered chroniclers’ reports turns out to be erroneous. The real lesson, of course, is to follow the spirit not the letter of those works. That spirit involved many patient hours of sifting through original sources such as scorebooks and newspaper reports. The significance of this discrepancy between received wisdom and contemporary evidence is that what looks like the smooth progress of a stable club was nothing of the sort. Cambridge and Cambridgeshire cricket went through many stages with different clubs emerging and being significant in their own ways — Cambridge cricket Club of the 18th and early 19th centuries, various pub clubs such as the Cambridge Castle Club, Cambridgeshire sides in 1832/34, the Cambridge Town Club, the Town and County Club, amateur County teams of the 1850’s, the County Club of the 1860s and county sides organised by other bodies — An understanding of these stages is crucial not only to an understanding of cricket in Cambridge but also to why Cambridgeshire cricket in the 1860’s was turbulent and insecure with a talented team of players but little else as solid to back it up. What it is inaccurate to say, however, that one cannot tell Cambridge from Cambridgeshire teams of this period, a claim which is claimed both in respected publications and websites such as Wikipedia. The most confusing team in this context was the Cambridge Town and County Club, due to its having “County” in its title. Again the contemporary newspapers suggest strongly that this was a Town Club with County pretensions, but never actually a County Club. Subsequent historians such as Rowland Bowen have nevertheless regarded it as an early form of the County Club. I would suggest that a more useful perspective would be to see the Cambridge town and County Club as a hybrid pre-county club. If you go to “research so far” you will find a list of the teams I know of that have been retrospectively called Cambridge Town Club. Some details of the Cambridgeshire teams are given in “current research”and “1st Cambs sides”. I would be interested in hearing other views on this subject. “IPSWICH….Tuesday last a cricket match was played between the University of Cambridge and the Town, when the latter was beat by 60 notches.” Ipswich Journal, Saturday May 30, 1801. “CRICKET–The Grand Cricket Match between the gentlemen of the University of Cambridge, and the St. John’s Wood Club, was decided yesterday in Lord’s Ground, Marylebone, in favour of Cambridge. Cambridge beat by 11 runs in one innings. Bets even at starting; at the end of first innings of St. John’s Wood, 5 to 4 in favour of St. John’s Wood.” Morning Post (London), Thursday, July 21, 1814 & Cambridge Chronicle, Friday July 22, 1814. Apart from four matches in 1854/55 reported as between Cambridge University and Eton, which were most probably internal University matches between former Eton scholars and the rest of the University, these two reports predate the previously known earliest Cambridge University match in 1817. The 1801 match was presumably between the University and Ipswich Town as it was reported under Ipswich news and I have found no reference to suggest that Cambridge Town might have been involved. Why Ipswich? How official a match was this? etc. The 1814 match, despite the loss of Lord’s records in the 1825 fire, is surprisingly unknown, as it was clearly reported in the contemporary press. Again you want to know how the match came about and how official a University side this was. Both reports beg the question of how isolated such matches were and whether there were other similar matches played but now lost in the past. I am currently putting together a series of articles which I hope will build into an overview of Cambridgeshire’s cricket history up to 1890, telling the story through key events. I shall put them on this site on the “new writing” page, in draft form, so if anyone wants to comment on them in any way please do. “1613 – A special piece of Cambridge” on the origins of Parker’s Piece. “1710 – ‘To make a match at foot-ball or cricket’ ” on the first contemporary reference to cricket in Cambridgeshire. “1744 – A very numerous meeting of the best fashion” on the first reported match in the county. “1751 – High times at Newmarket – All England v Eton” on an untypical but impressive grand match. “1754-55 – CU v Eton” on the first reported University matches. “1757 – Cambridge Town cricket begins its journey” on the town’s first match. “1764 – Royston joins the fray” on Royston’s first match. “1771 – For the attention of Cambridgeshire cricketers” on an Ipswich Journal match notice. “1791 – The Chatteris lads to Manea came” on a match recorded in a poem. “1791 – You take Suffolk I’ll take Cambridge” on the first reference to a “Cambridgeshire” side. “1795 – Cricket morning and evening” on a Cambridge local club match. “1801 – The CU comes out” on possibly the earliest CU away match. “1801 – Wisbech in a flurry” on some high profile Wisbech matches. “1815 – ‘This Olympic game’ ” on Cambridge v Biggleswade. “1815 – The regular game of single wicket” on a run of single wicket matches. 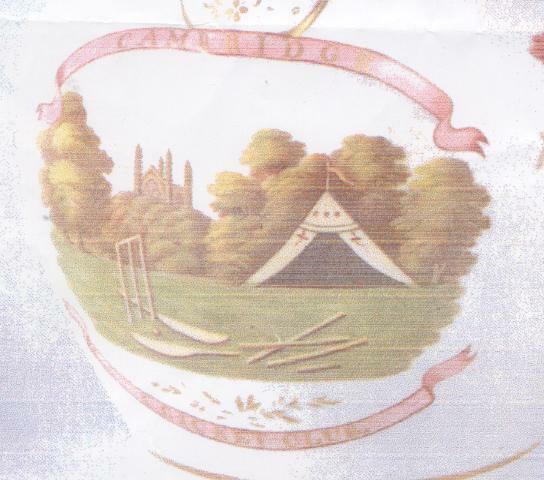 “1816 – A most sumptuous dinner” on the success of Cambridge Cricket Club. “1816 – Clodhoppers in the Fens” on Fenland cricket. “1817 – The university comes to town” on the first Town v Gown match. “1818/19 – Newmarket ups the stakes” on Holt v Newmarket and Cambridge. “1821 – The CU conforms to type” on the CU’s private ground. 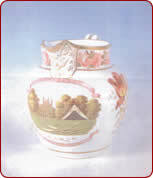 “1825 – Cricketing artisans” on Cambridge Fountain Club. “1827 March v Cambridge Hoop – The north will rise” on March CC. “1827 – The varsity match” on the first Oxford v Cambridge match. “1830 – Fenner disappears to the Fens” on Fenner’s move to Chatteris. “1830 – The Union goes to London” on Cambridge Union Club v Islington Albion. “1831 – Cricket on a new level” on Cambridge cricket going up a gear. “1832/4 – Cambridgeshire unites” on the first Cambridgeshire sides. “1837 – Cambridge Town Club – it’s official” on the formation of the Cambridge Town Club. “1838 – Town and gown or master and servant” on joint university/town sides. “1842 – Jobs for the lads” on engagements of early Cambridge professionals. “1844 – Make way for the Cambridge Town and County Club” on the early years of the CT&CC. “1846 – Avoiding the hubub” on Lords Darnley’s and Burleigh’s new ground. 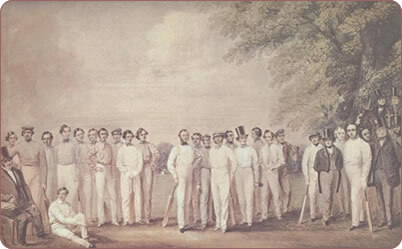 “1846 – Cambridge against England” on CT&CC’s defeat of England Gents. “1847 – Two of a kind?” – on Nicholas Felix’s picture of CU and CT&CC. “1847 – Hard times in old Cambridge” – on professionals’ hardships. 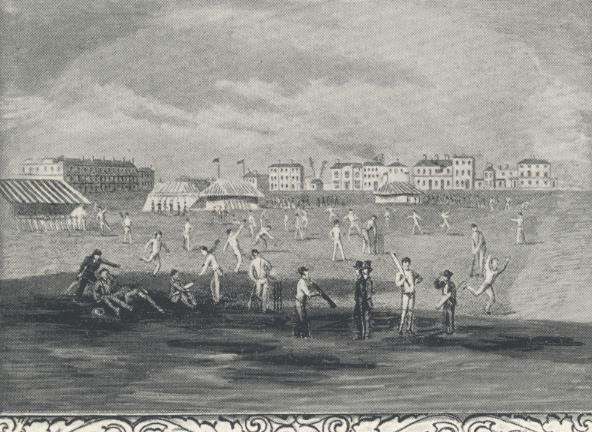 “1848 – Fenner’s ground opens” on the opening of CU’s new private ground. 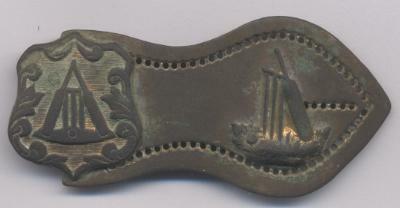 This lovely belt buckle is dated 1864, which is a great date for Cambridgeshire cricket – arguably at the peak of its powers. It was found in Barton near Cambridge and so may well have Cambridgeshire connections. 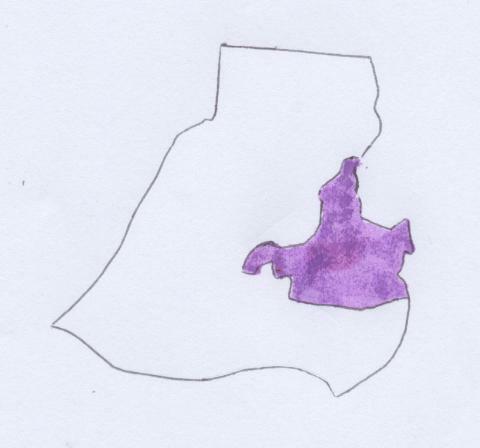 Has anybody seen a design like this before? Please let me know if you have as I would love to know more about it. Why did Cambridgeshire not stay 1st-class? This is the obvious question to ask about Cambridgeshire cricket in the 19th century. “1857-71” attempts to trace the answer back to the game’s roots in the county and the various key factors that threatened instability such as: Cambridge University, lack of money, dependence on professionals, and a relative lack of county identity. Please read to find out more. According to most records, Cambridgeshire played four county matches in 1861. Closer inspection, however, reveals that those matches had three different sources. The two versus Surrey were arranged by the Cambridge County Club. The match with Yorkshire and Stockton is less clear but probably the result of a collaboration between John Jackson, a bookmaker and horse stud farmer from Richmond, Dr W Richardson, president of Stockton-on-Tees CC, and the Cambridge professionals. The remaining match, with Kent, was, despite its usual title, a match between Cambridge Town Club and Kent County Club. This was not altogether to Kent’s liking and the article on the “What’s In A Name” page tells the story. (See also “A Rose by any other name?” below). An intriguing aspect of Tarrant’s life that I am gradually becoming aware of is that he appears to have lived a double life of sorts – as George Tarrant for cricketing purposes and as George Wood in his family life. Whilst I knew that his death was registered in 1870 in the name of George Frederick Wood I have only just discovered that his marriage in 1860 was registered in the same way. In the 1861 census he described himself as George Wood, despite having been called George Tarrant in 1851 when living with his father and mother. His widow appears to have called herself Martha Tarrant in 1871 and Martha Tarrant Wood in 1881. Despite Richard Daft’s commonly quoted assertion, George does not seem to appear in official records as George Tarrant Wood. Up to now I have concentrated on local newspapers as my source of information on Cambridgeshire’s cricket history. I would like to expand on that by talking to people who have memories or documents relating to cricket in Cambridgeshire of the past. Stories told to you by your grandparents maybe, or photographs in the family album. If you, or you know someone who, would be willing to talk to me about such memories or artifacts I would be very interested. Thanks to the British Newspaper Archive online I have been able to expand my newspaper search to papers from outside of Cambridgeshire and have found some interesting stuff. Some time ago I was contacted by a great grandson of George Harvey, one of the professional cricketers recorded in the 1861 census as living in Cambridge (see “Cricket ghetto shock” below). Born around 1835, Harvey continued to describe himself as a cricketer in subsequent censuses, changing to cricket umpire in 1891. Two pictures included on the gallery page show him in this latter capacity for the Pembroke College 1st XI. Other than that, however I can only find three clear references to his playing cricket in Cambridge, once in 1856 and twice in 1860. For a professional cricketer in the 1860’s this seems odd, unless he spent most of his time in the nets at Pembroke College or else was engaged somewhere else in the country. Does anyone have any knowledge of him? By the mid-19th century the professional touring elevens such as the All and the United All England Elevens, public schools, universities and an ever-increasing number of cricket clubs were providing some sort of income for professional cricketers. This sobering item, however, shows that not all professional cricketers were able to ride that particular gravy train. Daniel Hayward was probably born just a few years too early. For a likeness of Daniel Hayward, made at about the same time as he was petitioning for insolvency, see the picture at the top of this page. Dan Hayward is the first of the third standing group looking left to right. This picture has been variously identified as depicting a Cambridge Town v University match in 1846 or a University Club Smokers v Non-smokers match of the same year. There is a reference in Charles Box’s “Theory and Practice of Cricket” (1868), to a picture fitting the second option hanging in the University Ground club-house. That would at least confirm such a picture’s existence and the details of this painting, with the puffs of smoke, do match such a description. See the “gallery” page for a comparison of this with similar pictures. Requests for information on the above two cricket clubs have led me to several interesting finds. Whilst at least one match was played by Six Mile Bottom – against Balsham in 1849 – in the first half of the 19th century, the former was barely populated and better used as a venue for gambling, being in easy reach of Newmarket but a little off the beaten track if the authorities were to be avoided. It was used for bare knuckle fighting and even for betting on a leap-frog contest. It was not until the 1870’s that the game of cricket was again reported in the area. Grantchester played three matches as early as 1843/44 but appear not to have been reported again until 1849 when the formation of “a very spirited and well arranged Cricket Club” was reported. Again matches ceased to be reported after only a few years, the next local newspaper reports being in 1863. I have William Cornwell’s great,great,great granddaughter to thank for spurring me to find out more about this five times Cambridgeshire wicket-keeper/batsman (see picture right). Look on the “William Cornwell” page to find a profile of his cricket career. I would still love to hear from anyone who has memories or stories of women in and around Cambridgeshire cricket. The sport itself was even more dominated by men 150 years ago than today and that’s saying something. Nevertheless not far below the surface of 19th century cricket history is the role played by women, particularly as wives. In the 1861 census, for example, alongside the twenty or so young men describing themselves as professional cricketers was Eliza Hayward, the widow of Daniel of Mitcham, Surrey, Chatteris, England, the Players and Cambridge Town and County Club. Eliza described herself as a “gardener’s widow”, no mention of cricket. Is this incidental or does it speak volumes about the insecurity of a professonal cricketer’s wife and family? Similarly Sarah Buttress, the wife of Billy, who has garnered much fascination through his drink problems as much as for his innovative leg-breaks, took in laundry, probably not so much to supplement her husband’s earnings as to provide a reliable source of income in itself. When Chief Constable William Robinson wrote to local newspapers asking for help for professional cricketers on hard times, such as Buttress, George Tarrant and Fred Bell it was their wives and families that he was making his main consideration. Sarah, wife of Israel Haggis, who died relatively young from cholera, was reported to have physically fought for his possessions after his death, again pointing up the vulnerability of cricketers’ wives. She survived the epidemic and appeared in the 1861 census taking in lodgers one of whom was described as a cricketer. These examples may or may not be typical, but they are notable. In checking the census of 1861 for confirmation of Billy Buttress’s address in Eden St in Cambridge I found, to my delight, no less than 21 men living in the same parish of St Andrew the Less who gave their profession as “cricketer”. This may be explained partly by the nearby presence of the University cricket ground, Fenner’s, as the University club certainly employed local players during it’s short season, although probably not in those numbers. Only a handful were the known professionals from the County side. Was this an expression of these, mostly young, men’s aspirations or simply an attempt to impress? If the latter then it does not seem to have impressed everyone as in the same parish Elizabeth Hayward, mother of Daniel and Thomas and grandmother of T W, described herself as a “gardener’s widow” making no allusion to her late husband’s pedigree as a cricketer. 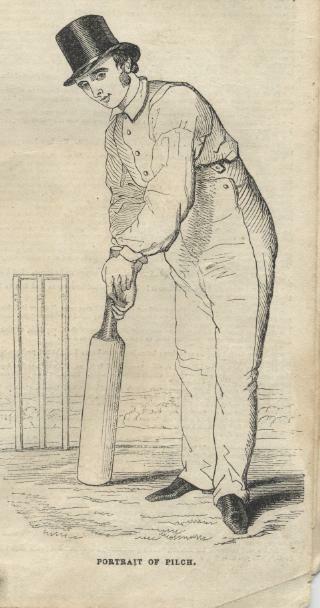 Amongst those claiming professional connection with the game were known names like Walter Watts, groundsman at Fenner’s, Samuel Dakin, formerly of Leicestershire, at 57 years of age describing himself as a manufacturer of leg-guards, and Charles Arnold, hero of the Cambridge v Gentlemen of England match in 1846. Somewhat younger were a 16 year old Edward O’Hara, lodging with Israel Haggis’s widow Sarah, and Charles Barker, taker of 6 wickets in the last Town v Gown match in 1861. Thanks to Horseheath village archivist Stuart Miller, I am now aware that the Shudy Camps and Horseheath Cricket Club was formed in 1850. A year later it seems to have been reformed as the Horseheath Cricket Club. The club survived with considerable success throughout most of the 1850’s playing the likes of Balsham and Linton locally, Saffron Walden and Haverhill from across the county border, and the Cambridge Britannia and Hope Clubs. By the end of the 1850’s the Horseheath Club seems to have folded with most of its players appearing for Linton, Abbington or Carlton. It was to emerge again later. One of the less talked about Cambridgeshire players, despite his being a mainstay opening bowler for the county from 1857-1867, is Frederick Reginald Reynolds. That may be because he has a prior claim to fame in being a player, ground manager and historian at Lancashire’s Old Trafford ground from 1860 to 1908. A recent glance at the introduction to a welcome 2000 reprint of Reynold’s “Lancashire County Cricket” has made me want to restore his place in Cambridgeshire cricket history. Watch this space! Any information would be very welcome. Thanks to Keith Hayhurst’s Pictorial History of Lancashire County Cricket Club you will find this picture of Reynolds on the “gallery” page. The nearest C19th Cambridgeshire cricket had to noble patronage was Sir St Vincent Cotton of Madingley Hall just north of Cambridge. 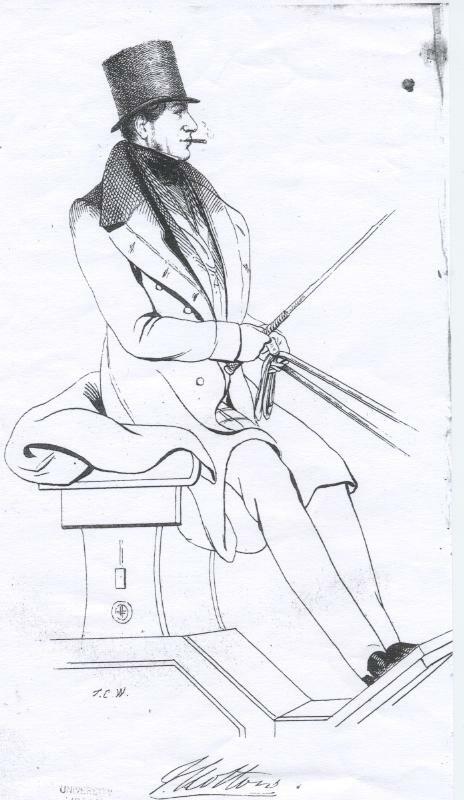 He was also a player, president of the Cambridge town and County Club, inveterate gambler and coach driver. A recent article in the Cricket statistician (“Felix Ladbroke and Cricket on Epsom Downs” by Ralph M Hudson) referred to Cotton as a “great” cricketer. Unfortunately this appears to be an exaggeration. See “Research so far” for details. “1st Cambs sides” pages for details. Thanks to Giles Phillips for the team pictures of the 1868 England tour of US and Canada (see Gallery). These contain the first likenesses of John Smith I have seen as well as another representation of George Tarrant. Newspapers of the time announced a painting of John Smith on his own but I have yet to hear of its continued existence. For the record I am still keen to see likenesses of Israel Haggis, Dan Hayward Jnr, William Buttress, FC Pryor and Thomas Snow, as well as the many Cambridgeshire players from outside Cambridge during the period 1700-1890. Anyone wishing to try their hand at imaginative drawing might like to draw an impression of one of the above. That would be great. For me, the most intriguing find in Gerald Brodribb’s “The Art of Nicholas Felix” is the author’s assertion that Felix included a self-portrait in his group portrait of the Cambridge Town and University teams. When I first saw the picture in question (see top of this page) I also thought that the player on the right-hand edge of the centre group was indeed the artist as this portrait looked so similar to that of Felix in the All England Eleven picture. Subsequently, however, I received a copy of a caption for the Cambridge picture which identified the portrait as being of John Boning of the Cambridge Town and County side. It would certainly have been odd had Boning been excluded from this picture as he was a mainstay of the club throughout its existence. On the other hand I would have expected the author of more than one book on Felix to recognise his subject. Can anyone help? With the help of my friend Michael in 2009 I took photographs of places associated with 18th & 19th century cricket in Cambridge. Below right is an attempt to recreate the view shown in 1854. 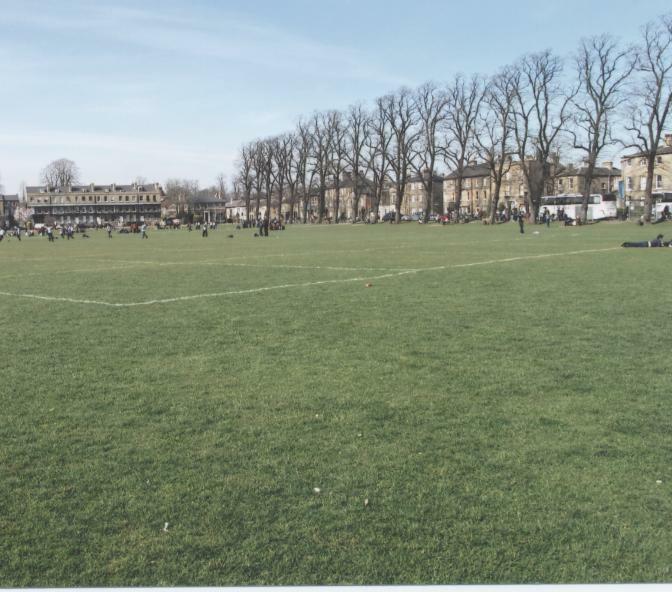 Cricket is still played on the same area of Parker’s Piece, especially at weekends, although the activity shown in the distance in our photograph is kids from the local Parkside School in their break time. For more comparisons see the “gallery” page.